Have you ever found yourself so busy that the day goes by very quickly? Before you know it a week has past, only to turn around and realize that a whole month flew by before you barely noticed it. When you think about what you have been doing all that time, it seems like a blur. Sometimes, I wish that I could stop time. But I realize that stopping time is not an option regardless, of whether I want it to stop or not. I’ve come to recognize how important it is to live in the here and now. Tomorrow will come when it comes and yesterday is gone forever. But the here and now is all I have, so I know that I must make the best of every moment. Just recently, I went with my family on a mini vacation. We needed to stop because we had been busy and working a lot. On this trip, we were going to meet up with my older sister Jen, her husband Parker, and their daughter Isabella. I found myself wanting to enjoy every moment while I was there. I really wanted to have fun with my niece Isabella because I hadn’t seen her in a while. Although, it was a bit of a struggle to relax, at first, I was glad when I was finally able to unwind. Isabella and I had the best time together. I filmed her as she would do a little show she called “Newsly News.” She would talk about the day and different things that had happened. She was So Cute! After we built the castle we made sure that it had a flag. Then it needed a bridge. So we built one. Of course, it needed people so the sticks that we placed in the middle of the bridge became our people. If we must end the day at the beach we must end it with the most fun of all. One should get covered in the sand. How? 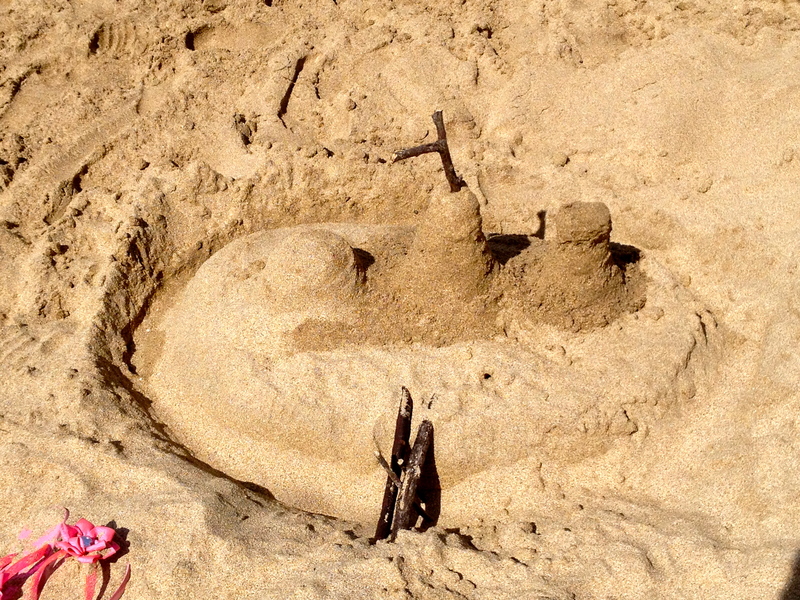 You may ask…by making a SAND ANGEL!!!!!! I must admit that I did not participate in this but I probably should have. Isabella laid down on the sand with eyes closed soaking in the sun rays. Then she went to work on making her Sand Angel. Now here’s a little girl who knows how to enjoy herself. She made the Best Sand Angel Ever!!! The time we spent together was So Precious. I wouldn’t trade those moments for all the money in the world. As I reflect back on these memories, I can’t help but think how important it is to not let those moments slip beyond my notice due to the busyness of life. The people in my life are important to me. I want to deliberately Stop and Enjoy being with them and make memories that count. I don’t want to live my life with regret. I want to value those that I am in relationship with and appreciate the treasure they really are. Romans 12:10 says, Love each other with genuine affection, and take delight in honoring each other. I have realized that when I take the time to show the people in my life how much I value them, it brings them honor and shows them the love of God in a fresh new way. This causes our relationship to grow in a deeper way and the result is that we enjoy being with one another the way God intended us to. I want to encourage you to take the time and show those that you care about how much you value them, by encouraging them, doing things with them that they will enjoy and most importantly by letting them know how important they are to you and to God. I believe as you do that your relationships will flourish the way that God wants them to. You will find true joy as you invest in their lives and have precious moments that are worth more than money.